Elections always have consequences, but the 2017 Bundestag election in Germany proved particularly consequential. With political upheaval across the globe—notably in Britain and the USA—it was vital to European and global order that Germany remain stable. And it did through the re-election of Angela Merkel as chancellor, now in her fourth term. Just under the surface, however, instability is mounting—exemplified by the entry of the right-wing Alternative for Germany (AfD) as the largest opposition party, the decline of the Social Democrats, the ever-restive Bavarians, and the growing factionalism within the Christian Democratic Union as the Merkel era comes to an end. 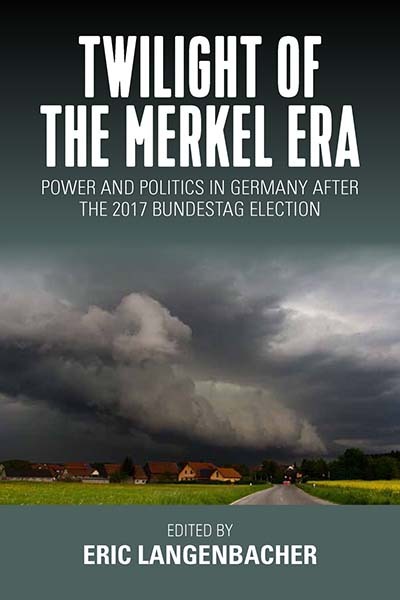 Paying special attention to the rise of the AfD, this volume delves into the campaign, leading political figures, the structure of the electorate, the state of the parties, the media environment, coalition negotiations, and policy impacts. Eric Langenbacher is a Teaching Professor and Director of the Honors Program in the Department of Government, Georgetown University. Recent publications include The German Polity, 11th edition, co-authored with David Conradt (Lanham, 2017) and Mapping Comparative Politics: Power and Legitimacy (Thousand Oaks, forthcoming 2019). He is also Managing Editor of German Politics and Society, which is housed in Georgetown University’s BMW Center for German and European Studies. Chapter 9. The AfD and the End of Containment in Germany?